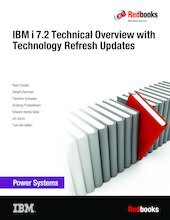 This IBM® Redbooks® publication provides a technical overview of the features, functions, and enhancements that are available in IBM i 7.2, including all the available Technology Refresh (TR) levels, from TR1 to TR3. This publication provides a summary and brief explanation of the many capabilities and functions in the operating system. It also describes many of the licensed programs and application development tools that are associated with IBM i. The information that is provided in this book is useful for clients, IBM Business Partners, and IBM service professionals that are involved with planning, supporting, upgrading, and implementing IBM i 7.2 solutions.